The turned chairs were of simple construction. 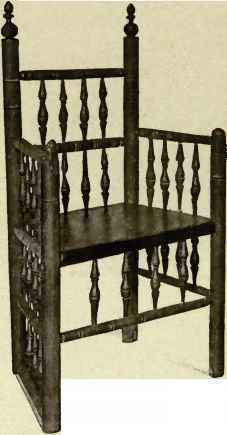 The rails were let into holes bored to receive them, mortised and tenoned, and were often held in place with draw-bore pins holding all the joints tight, thus giving the chair a solidity and strength which has resisted the ravages of time to such an extent that many specimens of the seventeenth-century chairs of this type are extant which are apparently as strong and sound in their joints as if made to-day. These chairs were made sometimes of oak or maple, but usually, at least so far as concerns this country, of ash with hickory spindles. The earliest turned chairs are the three-legged variety. They, of course, far antedate the settlement of America and probably were never made here, but several, notably the so-called Harvard College chair, came to this country in the early days and there is some mention of them in the inventories. They were made with two legs in front and one at the back; the back projecting the width of the front was supported from the front post by arms and by a projection of the rear leg. These chairs were called buffet or boffet chairs. In a Salem inventory of 1673 is mentioned "Three bufet chairs 12s." In the "Promptuarum Parvalorum" of Galfridius, published in the sixteenth century, is the following definition: "Bofet, thre fotyd stole." 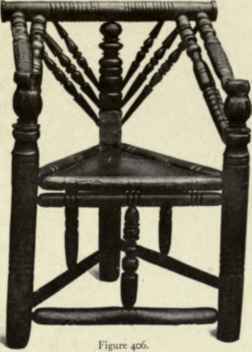 It is thought that this sort of chair is Byzantine and was introduced into Europe by the Normans and by them to England. There are not enough examples, however, surviving to enable one to draw positive conclusions. Figure 406 shows a typical three-legged chair with two legs in front and one at the back. 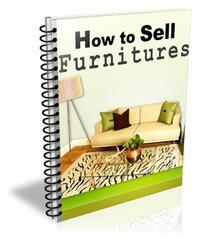 The rear leg extends up to and is fastened to the centre of the turned rail on the back. The back is further supported by three turned spindles extending from the rear leg to the under side of the rail and by two heavy spindles on each side extending from the ends of the rail to the front posts. There is a wooden seat, and a turned spindle strengthens the stretchers between each pair of legs. Turned Three-Legged or Boffet Chair, sixteenth century. Turned Three-Legged or Buffet Chair, early sixteenth century. each two legs are two spindles extending from the brace to the seat. I he surfaces are ornamented with little circles in scratch carv: ig and a large number of small projecting balls dowelled on. It would be very difficult to give a proper date to this piece, but it is probably of the late fifteenth or early sixteenth century. Ffeiis and the preceding chair are in the Bolles Collection, owned by the Metropolitan Museum of Art. Turned Chair, late sixteenth and early seventeenth centuries. Turned Chair, Carver style, first quarter seventeenth century. supported by braces which extend to and fasten into the extension of the front legs. From this rail arises the back which in turn is strengthened by another brace which fastens into the extension of the front legs. The underbracing is similar to that shown in the preceding figure. The back is similar to the so-called Carver type which is shown in the succeeding figure. century, for many specimens are found both of early and late variety. 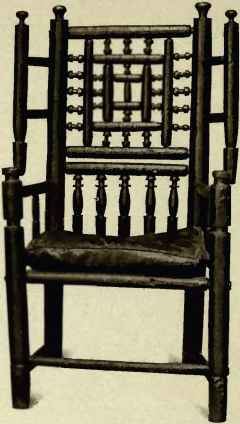 This style of chair is commonly known in this country as the Carver chair because of this specimen which is at Pilgrim Hall, Plymouth, and is said to have belonged to Governor Carver and to have been brought over by him in the Mayflower. They are found in large and small size and occasionally without arms. The earlier ones have heavy turned posts, the turning being very simple, while the later ones have smaller turned posts and the turning is in vase or other form. The chief characteristic of the type is the three rails and the three spindles in the back. These chairs are probably of Holland origin. They appear in the early Dutch paintings and in the interior views of the humbler homes, and were probably introduced into England from the Low Countries in the reign of Elizabeth. 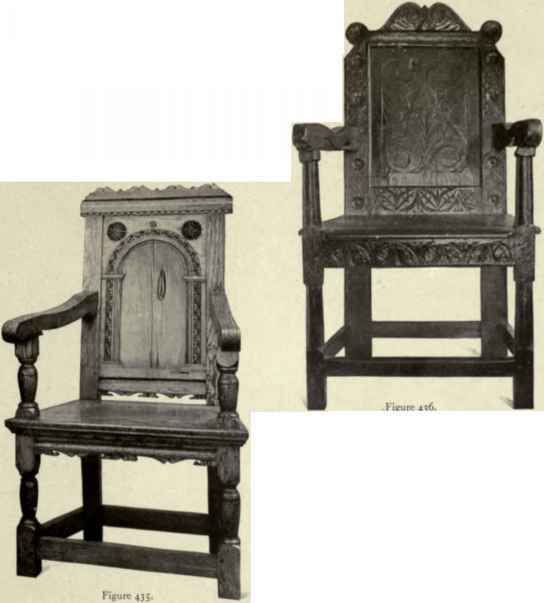 A Carver chair in an unusually good state of preservation is shown in Figure 410 and is the property of Mr. George Dudley Seymour, of New Haven. The finials of the back and front legs are large halls and the I:ne of the stiles is slightly broken with bulb turning. E ne construction in other respects is the same as that shown in the preceding figure. Turned, Chair, Carver style, 1650-1700.
i urned Cha.r, Carver style, about 1650. 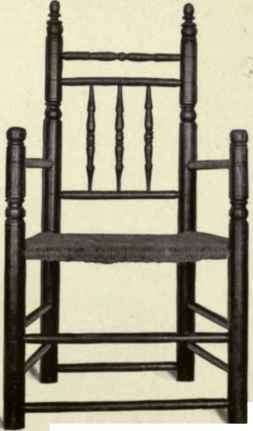 A later form of the Carver chair in the possession of the writer is shown in Figure 411. The turnings are smaller and are vase-shaped and the spindles and rails are lighter. Many of these chairs are found with legs cut down and the knobs on the front post cut off, but this piece is in its original cond i.ion except that the feet are probably worn off about a quarter to one-half inch. Figure 412 shows a side chair of the turned type under discussion. It will be seen that the tunr lg of the knobs at the back and the three spindles are the same as those shown in the preceding figure. There s, however, but a single instead of a double rail at the top. Side cha rs of tins type are not at all common n this country. This chair is 1 the Holies Collection at the Metropolitan Museum of Ait. 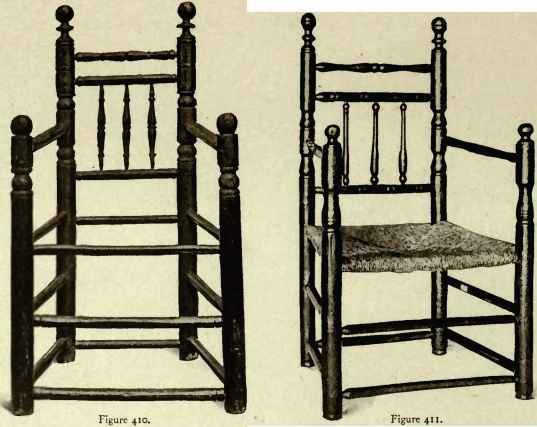 Figure 413 shows another chair of Carver type which is in the Blaney Collection. The turning at the top is more elaborate and the vase-shaped turnings are more pronounced than in the preceding pieces. The three spindles in the back are also more elaborately turned, all of which point to the fact that this chair is of somewhat later date than those shown in the preceding figures. Figure 414 shows another chair of the Carver type, which is known as a spinning-chair. It stands high from the Hoor, as high as a child's high chair, but it is full size and is a side instead of an arm chair. The back is in the conventional form of the Carver chairs, but the spindles are much more elaborately turned and arc in the form shown on the chair in the succeeding figure. The finials are also more intricately turned. The chair is in the possession of the writer. 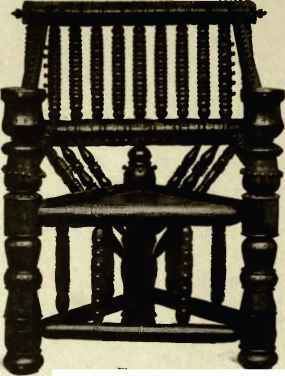 1 urned Chair, Brewster style, first quarter seventeenth century. ished the side and front beneath the chair. This chaii is complete only on one side, the front and other side having lost the lower tier. an upper section and two rails fastened mto the back posts and two uprights fastened into these rails. This same theme is repeated n diminishing size as the square becomes smaller. 1 he spaces between are filled with small turnings. The lower portion of the back has five sp iidles. On each side of the back project wings and long turnings supported at the post by two short ones, giving the suggestion of an easy-chair of a later period. 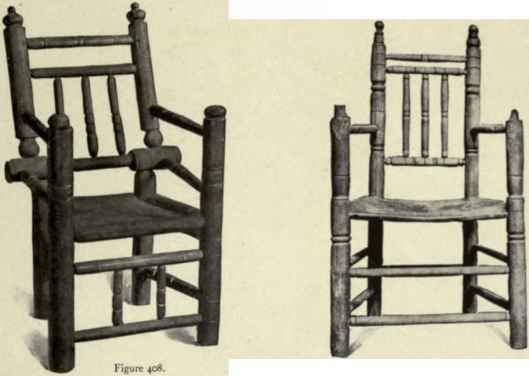 Figure 417 shows still another variation of a turned chair. Four ornately turned parallel rails finish the top of the back, and the back itself is composed of a series of rectangles, four in number, one inside the other, filling in the entire space. The space between the arms and in front under the seat has sausage-turned spindles, and short projecting wings are at each side of the top. These last two types, which are from the Bolles Collection, are of English origin and are extremely uncommon. The spindle-turned chair seems to have been a hybrid, for it completely disappears about the end of the seventeenth century, except that it was, perhaps, the prototype of the turned and cane chairs of the last quarter of the seventeenth century. What style of furniture is spindle chairs? What is the top of a spindle back chair called? What is a chair back spindle called that is largers in the middle?